Should I have Lipiflow® if have meibomitis? If you have meibomitis (aka meibomianitis) your ophthalmologist may have recommended a treatment with Lipiflow® which is a device which essentially warms your lids and squeezes out the contents. The meibomian glands sit in the posterior portion of the eye lids. They lay vertically, up and down. The glands have openings just behind where the lashes are located on each lid. Meibomian glands are oil glands in the back of the lids. Each eyelash is associated with a gland. ﻿Meibomitis is typically a low-grade disease process which involves blockage of the glands with thick, dirty oil production. This oily secretions can cause redness, tearing, irritation and blurriness as it is secreted into your eye. If you use gentle pressure, oil from the meibomian glands can be expressed from the opening of the gland. The oil from meibum glands is usually clear but when a patient has meibomitis, the oil can become thickened and yellow. dirty yellow oil of a patient with meibomitis. The Lipiflow® machine is a fancy way of first applying heat to soften the contents of the meibomian glands and then applying pressure to squeeze out the contents. Lipiflow® can be very expensive with some physicians charging $1000 for a treatment. In addition, once you have the treatment, if you are not taking routine care of yourself, you will have the same problem six months later. Save the money. Here's a better technique which works just as well if not better. This is a very effective 3 step procedure to clean out your glands. 1. Apply heat - hold a hot, wet towel (not too hot!) over your closed eyes for five minutes. 2. Massage - The correct way to do this is to massage only toward the lashes. So for the top lids you need to massage downward and for the bottom lids you need to massage upwards. Think of trying to squeeze toothpaste out of a tube. If you do not push toward the opening, nothing will come out. The opening of the meibum glands is at the base of the eye lashes so this is where you must massage towards. Do not massage side to side or in circles. 3. Scrub - This can be done with either Johnson & Johnson baby shampoo or with an over-the-counter product called OcuSoft. To do this correctly, you must use two hands on each eye lid. Use one hand to pull one lid away from the eye which will expose the base of the lashes. Then place a little bit of shampoo on the soft part of the tip of the finger and use your finger tip to scrub the lashes. Then rinse off with cool water. You cannot do a good job scrubbing your lids if your eyes are closed so make sure you keep them open while doing this! So save your money! You can do this yourself and you do not need Lipiflow® to give you a temporary, expensive fix. So your ophthalmologist has told you that you have a pterygium (also sometimes referred to as a "carnasita" in Spanish) and you are considering having surgery. This is a small pterygium in a right eye. This is a larger pterygium in a left eye which is encroaching on the central vision. A pterygium is a blood-vessel-filled, raised growth on the surface of the eye. A pterygium initially starts growing on the conjunctiva. (The conjunctiva is a mostly transparent "skin" of the eye which covers over the white part of the eye, the sclera.) As it enlarges, it crosses on to the cornea. (The cornea is a clear dome of tissue which covers over the iris and pupil.) As a pterygium grows larger, it appears to cover the the colored part of the eye and, eventually, the pupil. When it becomes advanced, it can begin to block the vision. People with pterygiums usually complains of redness, dryness, foreign body sensation and visual disturbance. It is not entirely clear what causes pterygiums but we do know that sun exposure is almost always a contributing factor. People who grow up in sunny places like Latin America or the Caribbean or who have jobs like lifeguarding at pools or landscaping are much more likely to get them. So surgery is usually the best option if you are having symptoms. The good thing is that if surgery is done well, it is easy for patients. But it has to be done the right way. 1. Doing surgery sooner rather than later is important. When a pterygium grows, it can grow into the substance of the cornea. When it is removed from the cornea, there can be irregular scar tissue left on the corneal surface. If that scar tissue is near the central vision, your sight could be permanently affected. So the key point is this: do not let your ptergyium get bigger because if a pterygium starts to affect your vision, it may affect your vision permanently. Better to do the surgery before it causes that kind of problem. 3. Make sure your surgeon is using a special medical "fibrin glue" to do the surgery instead of stiches. Stiches makes surgery longer and more painful. Stiches also make the healing process much more uncomfortable. (Patients can be just miserable.) Worse, stiches increase the risk of recurrence of your pterygium - meaning that after going through a longer surgery with a more difficult recovery, it could all grow back again. I am amazed that some surgeons still use sutures instead of fibrin glue. The glue is better in every way. If your doctor doesn't use the glue, find a different doctor. 4. Make sure your surgeon uses a "conjunctival graft". A conjunctival graft is used as healthy tissue which is placed in the area after the pterygium has been removed. Other options that are sometimes used are "amniotic membrane grafts" or leaving the underlying sclera bare to heal in on its own. These methods are both completely inferior to using a conjunctival graft and will make it more likely that your pterygium will grow back. 6. One of the risks of surgery is that the pterygium might grow back. Depending on how your doctor does the surgery, the risk can be extremely low. In our practice, we use a combination of fibrin glue, conjunctival grafts and mitomycin-C. We virtually never see our pterygiums grow back. If your doctor uses a different technique (e.g. suturing, amniotic membrane graft or no MMC), be aware that you may have problems again in the future. 7. Recovery after surgery is typically quick. The vision should be back to normal or even improved within a day or so after the surgery. The eye will be red and irritated for about four weeks surgery, improving as the weeks go by. I tell people that generally they can go right back to work if they want to. 8. After surgery, it is very important to keep your appointments for post-operative check-ups. Usually steroid eye drops are given to aide the healing process (prednisolone, dexamethasone, Durezol). In some patients, especially Latinos, the eye pressure can rise while on these medications. If you do not get checked, you will know if you are having this problem. Pressure issues can be usually be fixed by giving medication to control the pressure and switching to a different steroid like Lotemax. Should I get a toric lens implant for astigmatism? Astigmatism occurs when the focusing power of your eye is stronger along one direction than it is in another. For example, along the 180 degree direction the eye may have 47 units of focusing power and along the 90 degree direction, the eye may have 45 units of power. This difference of 2 units is the amount of astigmatism. A football has a more tightly curved surface in one direction - this tighter curve allows your hand to get around the football and it's where you grip the laces of the ball when you throw it. If you can imagine rotating that football 90 degrees while keeping your hand on the laces (you'll be holding the football the long way), the curve of the surface you are holding would be much flatter and you will not be able to grip the ball. Having uncorrected astigmatism at the end of the cataract surgery generally worsens the outcome and increases the chance of needing glasses for distance after healing. Therefore, astigmatism should be corrected during cataract surgery if possible. Astigmatism can come from either your cornea (the front part of the eye) or from your cataract (the now clouded lens inside the eye). If the astigmatism is generated by your cataract, then a toric lens implant is not needed because cataract surgery removes the cataract and the astigmatism it is creating. However, if the astigmatism is generated by your cornea, it will still be there after surgery (unless other measures are taken - see below). A toric lens implant can compensate for this astigmatism by balancing it out and should make you see much better after surgery. on which direction these dots are rotated towards. 1. Make sure your surgeon uses an "IOL Master" or "Lenstar" for measuring the length of my eye. These instruments are significantly more accurate than using an "A-scan" and if the length of an eye is not measured correctly, there could be a near-sighted or far-sighted result after surgery. This is a general rule for cataract surgery and not specific to someone with astigmatism. 2. Make sure your surgeon has a topography test performed on your cornea. Topography is the most accurate way to measure corneal astigmatism and gives your surgeon the best information with which to make decisions. Sometimes, corneal measurements can be gotten with an "IOL Master" but these are generally not as accurate. There are different opinions regarding the least amount of astigmatism you should have before considering a toric lens, but if the topography shows 1.25 units or more of astigmatism, it should definitely be considered. 3. If your topography shows no or little astigmatism, but your glasses measurement has significant astigmatism, this would indicate that your astigmatism is coming from your cataract. A toric lens is not needed since the astigmatism is not coming from the cornea. 4. The toric lens only comes with a yellowish tint. If you have had previous cataract surgery in the other eye and the lens implant used does not have a yellowish tint, you may not want to get a toric lens in this second eye. If you do, the eyes will see the world with different colors. 5. Your surgeon should either physically mark your eye with a marking pen before surgery (this does not hurt) or, on rare occasions, he may have an imaging device which essentially photographs the eye to help him track the movements of your eye during surgery. While someone is lying on the operating room table, often the eye will rotate a bit. If your eye rotates only 15 degrees, and your surgeon does not account for this rotation when he is aligning the direction of your lens implant, the entire effect of the astigmatism correction will be lost. You will have spent your money for nothing! - Ask the surgeon about making his cataract incision where the curve of the cornea is tighter. Not all surgeons are comfortable doing this, but they should be. Just by changing the location of the incision, the cornea will flatten out along the steeper direction and you should get some benefit. 7. Lens implant models only come in specific strengths (otherwise the manufacturer would have to produce an overwhelming number of implant models). Your surgeon will pick the toric lens implant which matches closest to the amount of astigmatism you have. That said, the amount a patient has rarely exactly matches the amounts available in the lens implants. The good news is that an exact match is generally not needed. A near match usually provides a big and worthwhile improvement. 8. Two plus negative two does not always equal zero. (Sometimes it can equal +0.1 or -0.1.) One might think that if there are two units of astigmatism coming from the cornea, a properly aligned toric lens placed with an opposite strength of negative two units would perfectly balance each other out and that the end result would be no astigmatism. However, that is not always the case. The reason usually has to do with the fact that the cornea has two surfaces. There is the front surface of the cornea which faces the air (and the tear film) and the back surface which faces the liquid inside of the eye. (Like a window which faces both the outside and inside of a house.) Topographers are typically very good at measuring the shape of the front surface of the cornea but many have no ability to measure the back shape of the cornea and even those that do are sometimes not very good at it. 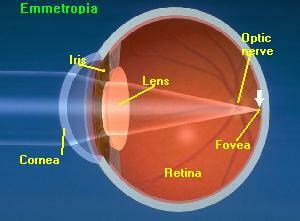 Astigmatism can be generated by both surfaces of the cornea. If our measurements and calculations account for the front surface of the cornea very well, but not the back surface, this lapse can sometimes lead to a surprise in the outcome. 9. Rarely after surgery, a toric lens implant can rotate. There are a few reasons this might happen but if you have careful surgery by your surgeon this is very unlikely with the Acrysof® IQ. (This problem was fairly common with an older model of toric lens made by company called Staar.) If your lens does rotate, even a little, the astigmatism correction can be lost. Your doctor may have to bring you back to the operating room to realign the lens so it faces the right direction again. If this is necessary, it is generally a pretty easy procedure and you should not get too worried about it.